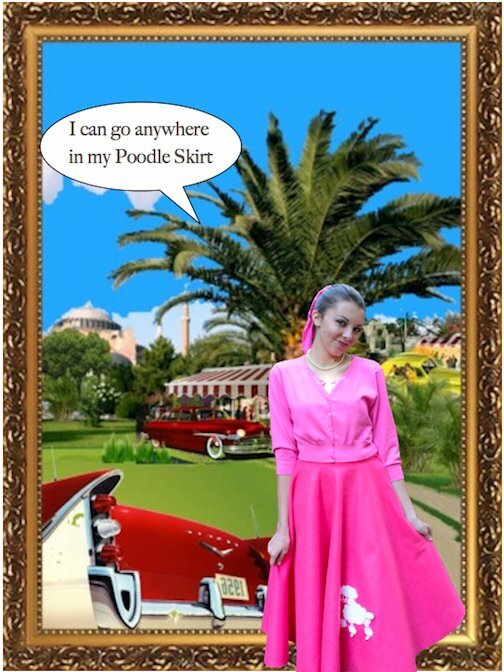 Watch the video on how to "make poodle skirt" and follow the tutorial below. It's easy to "Make Poodle Skirt", and there are only 3 pattern pieces. To top it off, you'll have a built in costume ready to go to most any costume party for years to come. Making a Poodle Skirt should take a couple of hours for someone with basic sewing skills, but stuff happens, so don't wait until the last minute. It also depends on how you put it together. Felt or Cotton or ? Review pattern directions completely before starting. I carry it around with me for a couple of days before I start sewing. Then I read it whenever I'm waiting. Makes the time go faster and I get things worked out before I start. How to make this poodle skirt as a summer skirt using cotton The summer version is made using this same Poodle skirt pattern, but is not a Poodle skirt. A couple of minutes to check that page could be helpful since it is the same pattern. 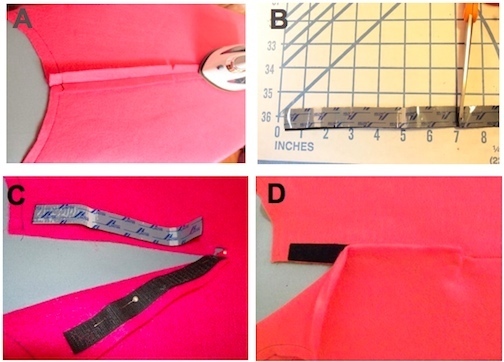 For this "Make Poodle Skirt" tutorial we are using pink felt and Velcro instead of a zipper. 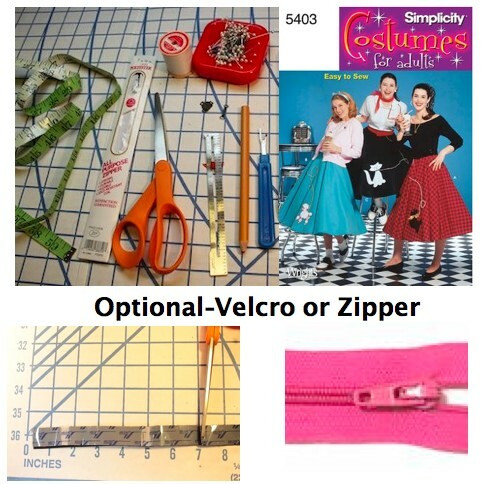 "How to Install a Zipper"
What you'll Need to "Make Poodle skirt"
Below are just a few of the many choices of materials that can be used for the making of the poodle skirt. Tools: Sewing machine, measuring tape, scissors, thread, needles,pins, iron. Large surface such as floor. Keep in mind felt is much wider than most other fabrics. Press on Poodle or sew-on Poodle or Make Poodle according to Pattern directions or In this example we used double sided interfacing (like double sided tape)and a ready made sew-on Poodle. See details below (last step of this project). Basically like a peel and stick. It's called double fusible interfacing used mostly by quilters.The photo above shows you what was used to make this Poodle Skirt, but obviously there are many variations. I used this Simplicity pattern, but you can do it without too. Personally I like having the pattern. Helps move things along faster by taking some of the guess work out of it, and I use it over and over. A. Double fabric when laying it out. Follow pattern directions. B. Place the pattern fold line on the fold of the fabric, & pin in place. B. Right sides together stitch front and back together, using a basting stitch (temporary stitch-longest stitch) on the Velcro/zipper side. Press open seam in preparation for Velcro/zipper. B. Cut Velcro to your taste. Only a couple of spots would do the trick. Warning: Velcro can easily snag the felt or other materials, so be sure to keep it fastened when wearing or storing. A. 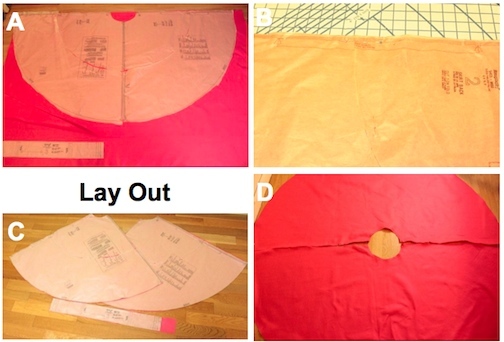 Press fusible interfacing to waistband according to directions for the interfacing. In this example we are using a damp cloth. B. Pin waistband to skirt waist. C. Press 5/8th hem on both top and bottom of waistband. D. Fold in half, lengthwise (inside out), press & sew. A. Notice waistband turned right side out except the end where it is still inside out. B. Turn waistband rightside out from end to end. Pin, press all the way around the waistband & prepare to sew. C. It should look like this. D. When done, sew on clasp or stick on Velcro. Try it on to double check location of closure (Velcro or Clasp). A. Using fusible web, measure by tracing the poodle. B. Web side down, paper side up, press with hot iron. C. When hot enough, peel off the paper of the fusible web. D. Place Poodle onto the glue left by the fusible web, and press with hot iron. Use tissue to protect the Poodle, and hold until Poodle is firm. 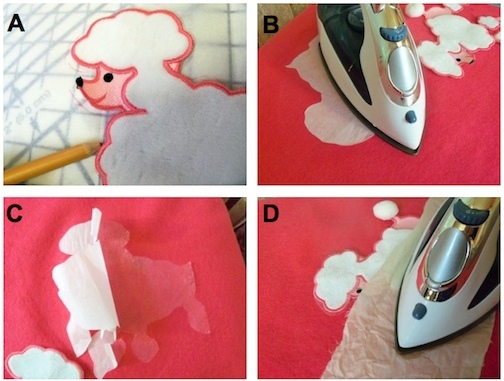 Note: Included in the Simplicity pattern on this page are patterns for making your own Poodle. 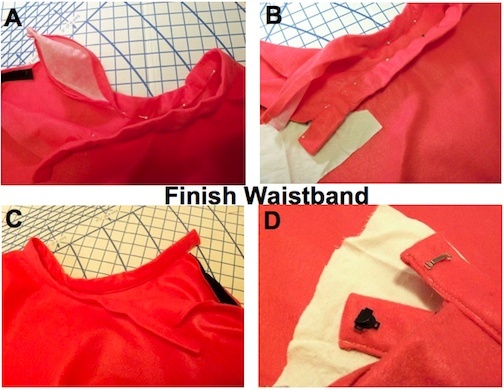 MORE ON "MAKE POODLE SKIRT"
This easy sewing project is a good way to brush up on old sewing skills, and would be recommended for a beginner, but only after a few basics like threading the machine, learning to make a seam, waistband and zipper or Velcro. All doable for anyone wanting to learn. In addition to the practice you get a practical costume out of the deal. Also check out these other "Beginner Sewing Projects". I try not to attempt even the easiest of projects just before a party. Take the pressure off and enjoy the process by starting the day before, or better yet the week before. Sometimes we don't know about the party until the last minute, so we go for it, and want to create something quick. 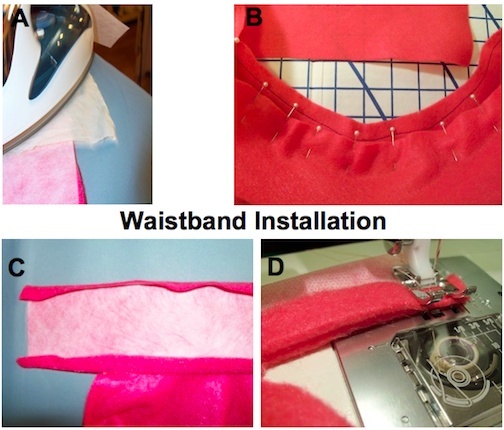 You can still "Make Poodle Skirt" quickly with Velcro instead of a zipper, Velcro in place of a sew-on waistband closure, no hem for felt, and a press-on Poodle. Just allow time for gathering the items you need.